The Holiday Gift Guide is always one of my favorite shows, and this year did not disappoint! 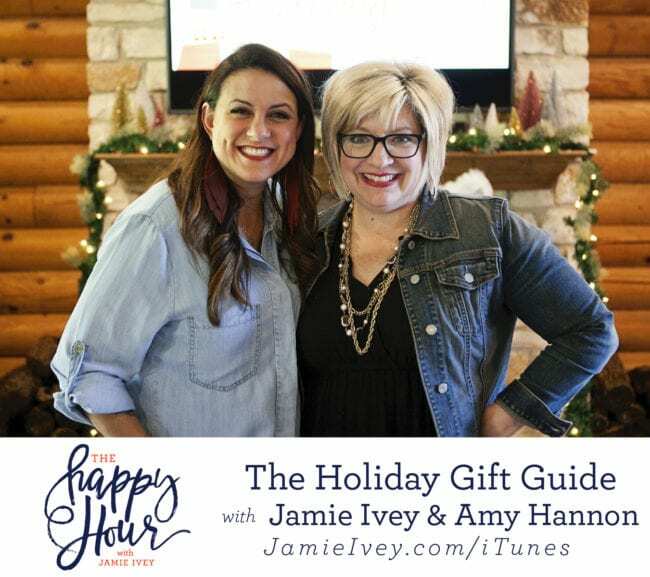 Amy and I had so much fun chatting about these fabulous companies and products and I’m pretty sure we’ll help you knock out some of your Christmas shopping. All the company info, links, and special offer codes are listed out for you down below, so enjoy and happy shopping! ABLE is a lifestyle brand on a mission to end generational poverty by providing economic opportunity for women. Their product line of jewelry, apparel, shoes, and leather goods are made locally in Nashville and globally in partnership with entrepreneurs in Ethiopia, Mexico, Peru, and Brazil. In August 2018, ABLE became the first company to publish their lowest wages because they believe complete transparency is the only way to protect and empower the industry’s vulnerable workers, most of whom are women. The Shop Forward® is a way to get all your holiday shopping done with fun + unique gifts while knowing that you are paying-it-forward with each purchase. Since launching a few years ago, The Shop Forward has partnered with various causes to raise over $2.7 million dollars. 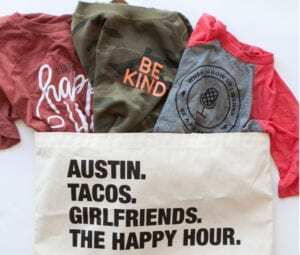 The Shop Forward is the home of the CHOOSE JOY tees + hoodies that support cancer care, ‘mama.’ tees that help out moms-in-need, and Espwa® products that spread hope in Haiti including our Born Year hats or custom 4 Things® Tote bags (w/ YOUR favorite 4 things on them!). The iconic #4ThingsTote has become our most in-demand item & most fun gift-giving item! Shop + Pay-It-Forward! Euna Mae’s is the retail expression of Amy Hannon’s biblical hospitality brand. Euna Mae’s, a one-of-a-kind kitchen-y boutique, came into being following Amy’s growing awareness that women had gotten away from opening their homes and hearts to others. She felt the Lord stir her to encourage and equip women to embrace the simple-yet-significant hospitality commands of 1 Peter 4:8-11 – Love. Welcome. Serve. The Euna Mae’s store features pretty and purposeful kitchen and home goods with a select few best-sellers featured online, including Amy’s comfort food cookbook “Love Welcome Serve”! Amy uses every opportunity — whether hosting events, speaking to groups, visiting inside her store, in her cookbook or on social media — to share her Love Welcome Serve ™ message of intentional kitchening so that in all things God may be praised. Scout & Cellar offers clean-crafted, organic, bio-dynamic, vegan, no sugar added wine hand picked by a Level 3 sommelier. The wine is sourced from boutique wineries around the world and have been tested to ensure no pesticides or chemicals have been added. The wine is clean and you can truly tell the difference. It’s a great gift for those who have everything, for clients, and for lovers of all things organic! Holiday packages, gifting options and gift cards are available as well as wine clubs or individual bottle purchase. With an ever-growing list of to-dos, it’s easy to feel overwhelmed and dispassionate by the tasks on your plate and disappointed you’re not spending enough time doing the things you love and caring for the people you love. The ladies at Cultivate What Matters want to press the reset button! For seven years, the PowerSheets(R) Intentional Goal Planner and their best-selling tools have helped thousands of women across the world live the life they want and can help you do the same, too! Cultivate What Matters was created to give you the community, resources, and encouragement to realize that you can make great things—big or small—happen! Most people think it’s hard to read the Bible every day. Grace Notes makes it easy to surround yourself with Bible verses so you can transform your mind with the power of God’s Word! Our beautifully designed monthly subscription includes a 5×7” print, a small print, and a sticker that feature the same design and verse. Our subscribers use their these to read, study, memorize, meditate, and be encouraged! We also include a card that you write on: one side what you’re praying about that month and the other side to write out the verse to help with retention. As a fun surprise we include a coordinating paper clip. It costs $10/month and the design and verse change every month so it’s always a surprise! Go Rings was originally created as a way to fundraise for an 11-month mission trip to 11 countries. We’re committed to creating handcrafted, ethically-made jewelry, while equipping those who are going out and spreading some light across our world. Our collection is handmade in both Haiti and Austin, using high-quality metals that won’t turn, tarnish, or react with your skin. 30% of each purchase goes to individuals & organizations who partner with us monthly, raising money to “Go make disciples” (Matt. 28:19). We’ve teamed up with over 500 women who have used Go Rings to fundraise for mission trips, unpaid internships, and other ventures to Go Do Good. The Happy Hour Shop is ready and stocked with so many fun things! You’ll love our new items such as the Be Kind sweatshirt which is super soft and what you’ll want to wear all winter long, our new Wild Kind of Beauty baseball tee, and the When I Grow Up I Wanna Be a Podcaster baseball tee for the favorite kiddos in your life. We’ve also restocked all of your Happy Hour faves including koozies, t-shirts, and the Jesus Is Better necklace from ABLE. You can also purchase my book If You Only Knew, and through the end of the year, I’ll be signing all copies purchased through the Happy Hour Store. I love this gift guide! I was trying to order something from primally pure and the HAPPYHOUR10 code isn’t working on their site. HAPPYHOUR – without the 10 did work. Just wanted you to know. I just saw Amy @ Central Baptist Church November 30! Fell in love! We do a meal ministry at our church, which started out for our shut-in’s and widows, and has GROWN! We are doing over 60 meals a month in our small town, people find out what we are doing and they reach out and ask us to take a meal to their mom, dad or parents. We pray over the meals, go and visit with the ones receiving the meal and pray with them. LOVE LOVE LOVE. I didn’t buy anything from this gift guide BUT I did use the coupon code for Take Away Luggage! Thanks so much for that savings!